Dubai: Doors will open for more Emirati women to compete after the creation of the UAE’s first women’s boxing team this week, according one of the two fighters Fahima Falaknaz. Prompted by last February’s ruling by world amateur boxing sanctioning body AIBA, which now allows Muslim female fighters to wear the hijab, two Emiratis started a first UAE women’s national team training camp in Abu Dhabi at Zayed Sports City on Friday. Falaknaz, 35, from Dubai and Hanan Al Zeyoudi, 24, from Sharjah, are preparing for next week’s camp in Uzbekistan ahead of the ASBC Asian Confederation Boxing Championships in Thailand from April 16. 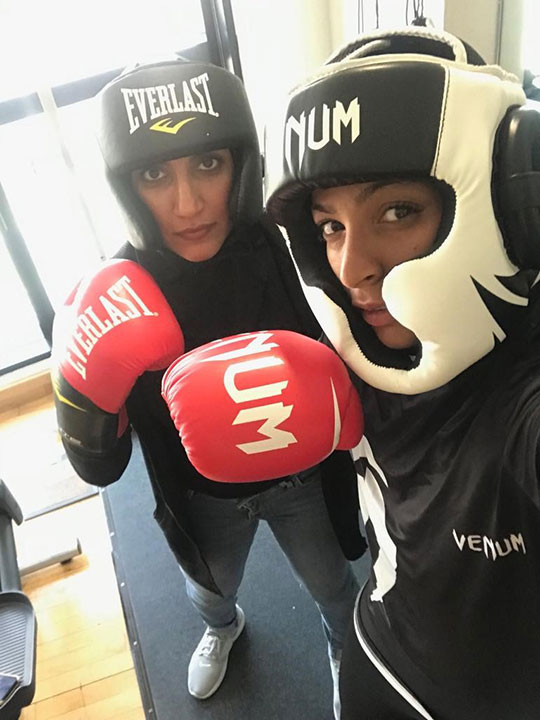 “This is a historic opportunity and I will be really proud to be one of the first women to represent my country in boxing,” Falaknaz told Gulf News. The 56-kg category fighter, who has only been boxing for a year and a half, but hasn’t yet fought competitively, said: “Hopefully we can inspire other Emirati women and open doors for them to follow us. “The end goal is to reach the Olympics, but as I can only fight for another five years, (the age cut off to compete is 40) this project is very much about inspiring and preparing others. “I will support them, especially ladies who don’t want to be trained by men, and after this I hope to train others in female-only sessions. Last year’s appointment of Emirati sports administrator Anas Al Otaiba as president of the Asian Boxing Confederation and a member of the AIBA executive committee has no doubt helped the rise of women’s boxing in the region, as he had made gender equality and the hijab rule his main mandate. However, Falaknaz says her ability to step into the ring is also thanks to changing attitudes in her culture. “There is a big change in society, people are more open, families are more relaxed and understanding. My family used to be stressed about me boxing but now they see Dubai is changing and becoming more open to the world. They are accepting it and they are supporting me. “Women shouldn’t listen to others who say women are weak and sensitive, they are strong and can do what men can do — we are female but we are still capable,” added the assistant manager of communication and customer care at DP World, who trains out of the Real Boxing Only Gym in Al Quoz.